Physics Buzz: HEY! I'm Orbiting Here! UPDATED: Math corrected from yesterday’s typos, see note at the bottom under “comments.” Also the Colorado based Center for Space Standards & Innovation put out a great simulation of the crash, you can see the video here. UPDATED UPDATE: Well, looks like I wasn't the only one to goof on the collision math at first. Kablammo! Like something out of a Bruce Willis movie, an American and a Russian satellite collided about 800 km above Siberia. The two blew apart into hundreds of pieces after smacking into each other at over 28,000 km per hour. It must've been one heck of a demolition derby up there. Even though there are over 17,000 man-made objects over 10 cm in orbit, this is the first time two satellites have accidentally collided. Two years ago China intentionally shot one of theirs out of the sky. NORAD is constantally tracking all satellites in the skies, so they can predict when the big ones are going to hit. We're interested in the odds of a random crash and it's clear that the odds of two satellites accidentally hitting each other is very low. How low you may ask? Lets try to figure it out. When we're calculating the frequency of hits for a satellite we need to start out with some facts and how they'll interact. We'll start out by borrowing an equation from molecular physics calculating the odds of two molecules colliding. Here "Z" is the frequency of collisions for a single particle (satellites in this case). "n" represents the density of particles, "d" represents the size of the particles and "C" represents their average speed. The entire equation is divided by 2 to prevent double counting of collisions. We can find the density of satellites by taking their total number divided by the volume of space they orbit in. Most satellites orbit in spheres between 500 and 1300 km above the surface of Earth. The equation V = 4/3 π r^3 gives us the volume of a sphere. Earth is about 6,300 km in diameter, making its radius (r) 3,150 km. 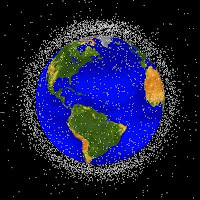 First we find the volume of space the lowest orbiting satellites are in and subtract it from the highest orbiting satellites getting a total volume of space satellites orbit in. Over 165 billion cubic km is a lot of space. Density here is simply number of satellites per volume. 17,000 / 165,348,213,000 = 1.02813328 × 10^-7 satellites per km^3. Finding their diameter is just a matter of estimating (we'll assume every satellite is spherical here for simplicity's sake). Satellites can run from small bits of space junk only 10 cm in diameter, to the International Space Station which is almost as big as a football field. For the sake of simplicity, ill round and say the average satellite size is 10 meters in diameter, or .01 km so we can keep all of our units straight. Giving us the result that an individual satellite will collide with another on average once every: 4.64682715 × 10^14 hours or roughly about once 53 billion years. So, not terribly common at all. This is only the roughest of calculations to figure this collisions conundrum. In fact collisions might be be more likely because these basic equations assume that all space junk is equally distributed, when in fact much if it is concentrated around the equator. The pull of gravity also factors in, as two bodies of junk will attract one another. On the other hand, the equation I used is for the random Brownian motion of molecules, rather than the ordered orbits of satellites in the sky. Molecules are much freer to move in 3 dimensions, while satellites are mostly trapped at a single altitude. That way, higher satellites are much less likely to interact with lower ones. But for a back of the envelope, off the top of my head, rule of thumb calculation, that's pretty close without bringing in calculus and probability curves and the like. Let me know what you think. Am I close, or am I just making stuff up as I go? Dumbass! You lose all credibility right there. >>The pull of gravity also factors in, as two bodies of junk will attract one another. Are you seriously this retarded about Newtonian physics??? Other than a few typos, looks like a pretty good guess to me. Thanks for the interesting calculation. Hey CH, chill. When you do an estimate like this 3/4 and 4/3 are close enough that you can just consider them to be 1 anyway. Personally, I would have estimated the volume of a sphere to be 3 r^3, it wouldn't change the estimate enough to matter (4 r^3 would be a little better). It's called a back-of-the-envelope estimate. If all else fails, attack grammar, spelling or typos. Also, I'm pretty sure CH was being charmingly sarcastic. At least I hope so. As it is, I'm thoroughly entertained with the thought of a satellite demolition derby, so I'm just going to fudge all the math a pretend it happens waaaaay more often. At least until my cell phone service goes out. Then I'll use your math. That’s one small typo for man. One major change to the end result. Lesson learned; never check your math using Wikipedia. My original equations from yesterday were thrown off because I flipped the equation for finding the volume of a sphere from 4/3 π r^3 to 3/4 π r^3, throwing off my density calculation and as a result my final answer. The volume I should have used was 1.65348213x10^11 cubic km rather than 9.3055544x10^10. This is a great example of the butterfly effect or how a slight difference early on can lead to a huge change farther down the line. My original volume ended up being an order of magnitudes off from the actual volume, leading to a huge difference in the final result. Originally I had a collision once every 98,518 years, a far cry from today's update. Live and learn I suppose. Though a note to some of the more disparaging commentators (CH I’m looking at you); just remember, it is always better to light a single candle than forever curse the darkness. so what are the odds? i googled it found this site. I was looking up at the sky thinking about the satellite collision and the odds of two satellites hitting each other. Has some calculated the ODDS on that happening. Don't we spend Billions on developing technology to take down Satellites? Anyway we should stop all research because the damn things hit each other up there. Really what are the odds? Thats why I was looking at the sky tonight. Radius - and not the diameter - of Earth is 6,378kms. An old thread I suppose, but perhaps you can still provide some feedback. These are back of the envelope type calculations, but you report that this kind of collision should happen about once every three million years. The fact that this has already happened once in our first 50 years of space doesn't prove anything. But the odds against it are 60,000:1. Also, the distribution of objects in space (with a minimum size of .1 meters) is going to be a lot closer to 1 meter than 10. That changes your results by a factor of 100, making it once every 300 million years. That changes the odds of the first 50 years including a collision to 6 billion:1. Based on those odds, I wonder if the equation chosen is correct. I don’t know much about molecular or orbital physics. This is just a suspicion from a non-expert. I appreciate your feedback.